• 20 minutes of free-writing each night after my daughter goes to sleep. • Write and edit two posts for my fledgling blog. • Finish the reading for and then write a craft annotation for my MFA program. • Write 12 pages (!) of my WIP for my latest creative writing submission for said MFA program. • Finish the end of the first draft of another WIP/ YA novel. This story has been so much fun to write, but it’s keeping me from focusing on the project on which I’m actually supposed to be working. Just a few more pages until this draft is done, then I’m lashing myself to the mast and ignoring its siren song. With work and my daughter thrown into the mix, I fear that I have bitten off more than I can chew this week, but we’ll see! 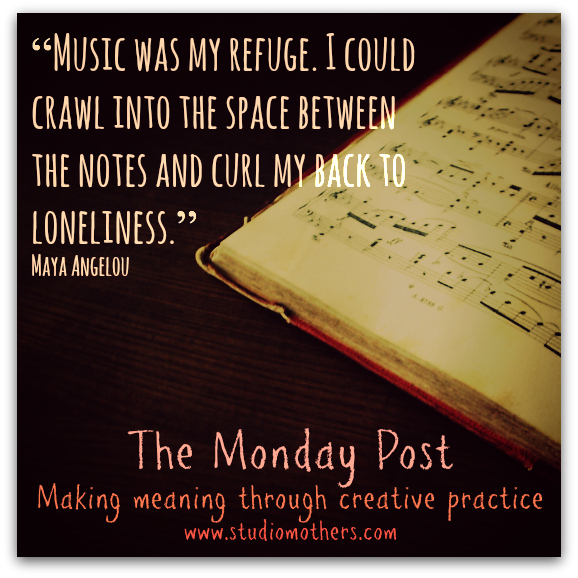 So great to have you at the Monday Post, Cynthia! Good luck this week — we look forward to hearing how it goes! Not quite ready for a daily practice, but I will write up an article about education on Tuesday night at 8pm. There’s my plan! Awesome, Judith! Love that you scheduled a specific time for your writing session. You’re so right. I’m more likely to do those things I schedule in. So here are my intentions: To take a bicycling break at least 3x/week and to knit at least 3 hours/week. Yay, Nancy! Good luck with the bicycling and knitting — looking forward to your update! A blessing of my freelance life is some flexibility to how I use my time, and though deadlines and financial realities mean I need to get things done (the kids are only at school for so long! ), including a bit of time for my creative work (which pays off in its own way) is important. I’m finding that if I start the day with this work, I feel more energetic and focused as I move into other tasks. So, as soon as I finish this comment, I will spend 30 minutes drafting a guest blog post. I will reserve 30 minutes for similar work each morning this week. I totally relate, K — and you’re so smart to delay jumping into the work day to take care of your personal creative work first. Brava! last week: keep in mind that i do more creative stuff than i necessarily focus on in these posts. photos, snippet writing, singing, dancing, etc…open up the nanowrimo manuscript, and see what i can do with it. check all but nano revisit. also rewrote another version of my query and synopsis and sent it out. and sang my tuckus off at a uu revival. this week: a loaded family schedule for the next few weeks or more. writing time tomorrow, will open nano. also meeting with minister to edit with help, my sermon for april. otherwise, dance class, choruus rehearsal, more photos, snippet writing, creative play with toots. Back in the saddle after school vacation week and a trip out to Ithaca for my oldest son’s senior recital — a great performance and an awesome trip all around. Another great thing that happened last week was that I re-subscribed to the daily New York Times. I’ve missed it so much. I love reading the actual newspaper — definitely worth the trek down my snowy driveway to fetch it. Makes the whole morning slow down. Not to mention that the newspaper overflows with interesting ideas that feed any creative person’s soul. And of course, the weekly frustrations with the Sunday crossword puzzle, which I am rarely able to complete beyond 75%. Good for the brain, regardless. Daily writing practice streak: 75 days in a row of logging a minimum of 500 words daily in my WIP. Had a few sessions early in the day, but for the most part am still leaving my daily practice for the evening. So getting my words done earlier in the day is again on my to-do list.